Suggestions that the government of Muammar Qaddafi is on its last legs and that life in Tripoli has drawn to a standstill as a result of the NATO bombing campaign are not based on reality, as any unbiased observer who has recently been in Tripoli, has witnessed. In one report from Tripoli, The Post’s Simon Denyer suggests that the Libyan government was faking some casualties as being the result of NATO airstrikes on civilian targets rather than merely from non-combat-related causes. That same meme was echoed by John Burns, who is running up the New York Times’ hotel tab in Tripoli reporting on the same “made-in-the-Pentagon” propaganda line. Having been to El Khadra Hospital in Tripoli, I can attest to the fact that several individuals were injured directly by NATO airstrikes, including many with shrapnel wounds to the legs, arms and torsos. While German Chancellor Angela Merkel was being swooned by President Barack Obama in Washington to commit German military forces to the NATO campaign against Libya, the Deutche Presse-Agentur, the German Press Agency, falsely reported from Tripoli that life in the sprawling city of some 1.3 million people had ground to a halt, that schools were closed and that stores were shuttered, as Qaddafi’s forces were increasingly coming under pressure, with some units defecting. My own account from Tripoli is that as of June 6, students of all ages were still in school, stores were open – although some larger food markets had limited hours of operation due to NATO sanctions on goods coming into Libya by air and ship – and that life in Tripoli continued as normal. The NATO sanctions have resulted in massive lines of cars, trucks and taxis queued up to fill up when petrol stations receive gasoline from land routes from Tunisia or from locally-refined oil. The NATO sanctions and their effect of the lives of Libyans living in the central government-controlled western region is a form of “collective punishment” designed to weaken the resolve of the western Libyans to support their embattled government. However, the sanctions are having the opposite effect, with even those who may have favored the replacement of the Qaddafi government now rallying around their government leaders as NATO prepares to usher in a neo-colonial administration. With Italy a member of the NATO coalition, Libyans recall Italian atrocities committed against Libya during Rome’s colonial occupation and Libyans will support Qaddafi against the Italians, French and British, who, along with the Americans and Canadians, seek to impose a puppet regime in Tripoli. Western Libyans in contact with their relatives in Benghazi, the eastern city under control of the Interim National Transition Council, report how life has changed under the rebels. The Benghazi interim council is made up of figures of exiled opposition groups long supported by the CIA, Britain’s MI-6 and the French Direction General de la Securite Exterieure (DGSE), recent defectors from Qaddafi’s government, and extremist Wahhabi Salafist elements encouraged and supported by Saudi Arabia, Qatar and the United Arab Emirates. Women in cities like Derna, which is under the control of Salafist veterans of the “Al Qaeda” operations in Afghanistan and Iraq, including some released from U.S. detention at Guantanamo Bay, Cuba, are afraid to leave their homes because the Salafists have imposed extremist Islamic codes on women appearing in public without the veil. Under Qaddafi, there were no restrictions on what women or men could wear in public. However, men cannot have beards in their Libyan passport photographs. The possession of Libyan passports bearing photographs of bearded Salafist leaders in the rebel movement indicate they have been issued fake passports by the rebel authorities in Benghazi. Civil servants, including teachers, in the rebel-held east have not been paid since rebel leaders looted the Central Bank of Libya in Benghazi of 900 million Libyan dinars and $500.5 million in U.S. cash. Although the central government in Tripoli would like to help Libyan citizens in the east, there is no way for payments to be transmitted to the idled civil servants, as well as pensioners and those families who received $500 per month under Libya’s oil revenue sharing program. The Libyan rebel “finance minister” Ali Tarhouni is believed to be a longtime CIA asset and it was he who planned the theft of the cash from the safe vault of the Central Bank in Benghazi, carried out with the assistance of a CIA-supplied safecracker from the United Arab Emirates. A number of Libyan ministers who defected from the government to the rebels were known to be opposed to Qaddafi’s policy of sharing revenue with the Libyan people and were more interested in fattening their own bank accounts and investment portfolios. It is not coincidental, therefore, that one of the first targets of the NATO warplanes was the office in Tripoli responsible for conducting an investigation of fraud of senior government officials. Many of the officials under investigation for fraud and corruption, including senior Qaddafi ministers, are now top officials of the Interim National Transition Council, recognized by France, Italy, Britain and other NATO countries as the “legitimate” government of Libya. Western nations are already cutting deals with rebel leaders for new oil concessions that will place the interests of Big Oil over those of the Libyan masses. The good news is that the fraud and corruption files in the building struck by NATO were backed up in a secure location and that these files will be used as evidence to indict the defectors who now serve on the interim council. The ministers and senior advisers implicated in corruption include former Justice Minister Mustafa Abdel Jalil, the nominal and ineffectual leader of the rebel interim council; Mahmoud Jibril, the U.S.-trained former planning minister and head of the Economic Development Board who is acting as prime minister of the rebel “Libyan Republic”; Dr. Ali el-Essawi, the trade and industry minister and former ambassador to India who is also a member of the Muslim Brotherhood; Interior Minister Abdul Fatah Yunis and a close friend of Qaddafi; and former Libyan intelligence chief and Foreign Minister Musa Kusa, another close friend of Qaddafi who was also the CIA’s point man in the agency’s “extraordinary rendition” and kidnapping program in Libya. As for the French support for the Libyan rebels, there is evidence that French President Nicolas Sarkozy and Bernard-Henri Levy, the French philosopher friend of alleged New York hotel sexual predator and former International Monetary Fund chief Dominique Strauss-Kahn, supported the rebels to permit Israel to extend its influence in Libya to offset Tel Aviv’s losses in Egypt. There have been credible reports that Levy, an early supporter of the Libyan rebels, convinced them during a recent visit to Benghazi to permit Israel to establish a military base in eastern Cyrenaica on a 30-year lease. In return for the base, Israel would exert its power in Washington, London, Paris, Berlin and Rome to have NATO step up its military campaign in Libya, and Israel would covertly provide the rebels with specialized military and intelligence assistance. Just after Levy’s shuttle diplomacy between Benghazi and Jerusalem, where he met with Prime Minister Binyamin Netanyahu, NATO committed helicopter gunships for the first time to its Libya campaign. There has been no mention of the Israeli involvement in Libya in the New York Times, Washington Post or Los Angeles Times, which is not surprising considering the pro-Israeli leanings of the ownership of those newspapers. There has been no mention by the Western media, in their zeal to promote the Pentagon and NATO line, that some Libyan rebels acceded to the government’s offer of an amnesty if the rebels gave up their weapons. After rebels handed over their weapons in Misrata and in the western mountains, NATO increased its bombings of the two regions. Corporate media “war correspondents” travel in a pack and, whether they are American, British, French, German, Canadian or Italian, merely ape the line of the Western military. In the case of Libya, the corporate war reporters hype the rebel successes while their counterparts at the Rixos Hotel in Tripoli jump on every chance to paint the Libyan government as disingenuous and exaggerating NATO collateral damage. However, this reporter witnessed the results of a NATO airstrike in a residential neighborhood of Tripoli that killed five people, including Qaddafi’s son, Saif al-Arab Qaddafi and Col. Qaddafi’s three grandchildren. 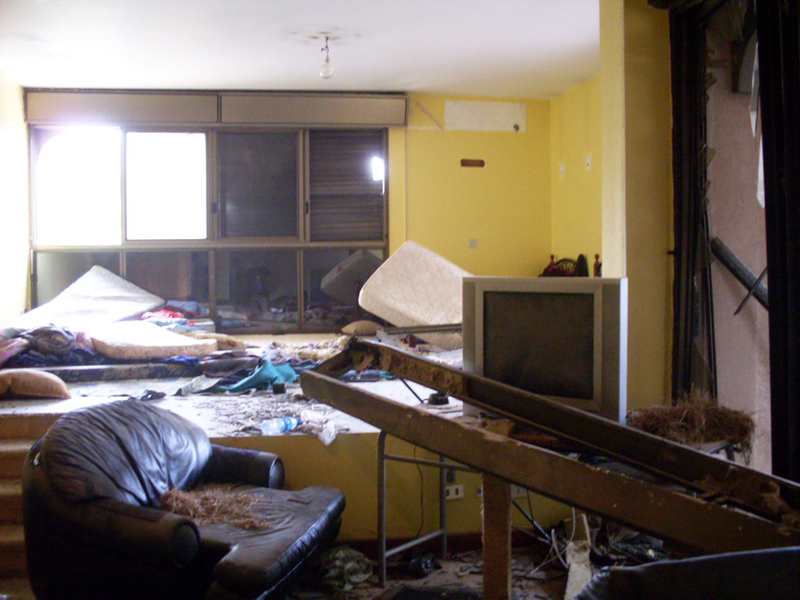 Neighboring homes, located only a block from the embassy of Ivory Coast, were also severely damaged in the NATO attack. Other corporate media reports out of Benghazi have suggested rebel victories in the western part of Libya, in towns along the main highway route from Tripoli to the Tunisian border. 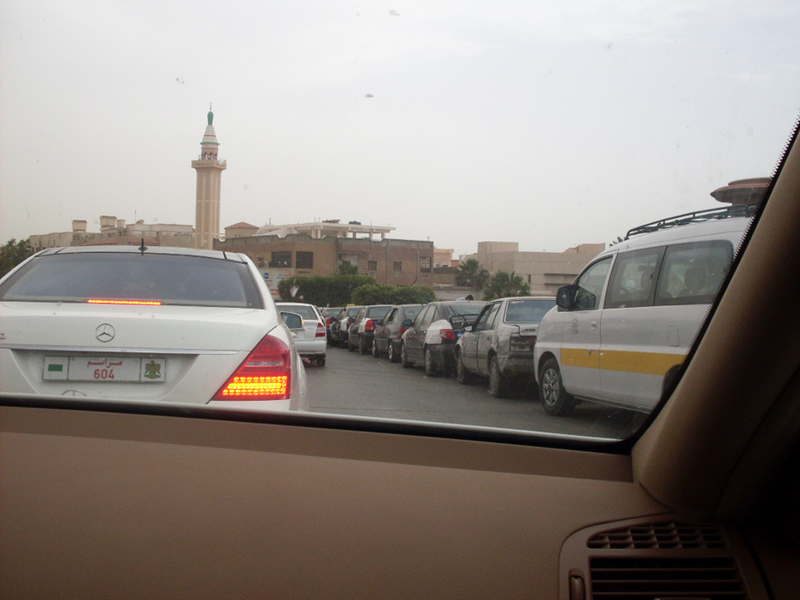 Having traveled the route on June 6, this reporter can attest that there were no signs of any rebel presence, with every town and city between Tripoli and the border flying the green flag of the Jamahiriyah. There were no flags flying of the former feudal royalist regime, the flag used by the rebels, from Tripoli to Tunisia. 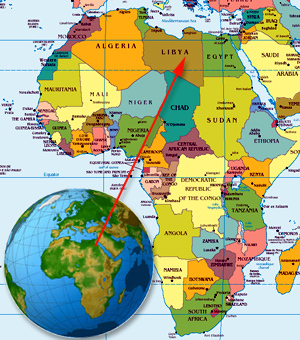 The only gunfire heard in the region was from Tunisian troops called in to quell Black African worker refugees from the fighting in Libya crossing back and forth across the unguarded border near the actual border crossing stations. The Libyan government has set up a phone number in Tunisia that promises displaced workers housing and financial support if they return to Libya. The rebels attacked several Black African workers from sub-Saharan and Pan-Sahel countries merely because of the color of their skin. Several workers were killed and wounded and many Black African women, including the wives and daughters of the guest workers, were raped by the rebels. Yet there has been very little reported about the Arab-on-Black violence by the rebels in the corporate media, ever anxious to cover for the Pentagon, CIA, White House and NATO headquarters in Brussels. Nor is there mention of the disposal of the bodies of the victims of rebel violence: the mass burning of bodies of victims to erase any trace of crimes against humanity committed by the U.S.- and NATO-backed rebel forces. It has been said many times that in war the first casualty is the truth. However, journalists have a duty to report the truth regardless of the whims of their governments. As we have seen in Libya and, before, in Iraq, Afghanistan, Pakistan, Lebanon, Gaza and the West Bank, Darfur, Rwanda, Somalia and Yemen, modern-day corporate journalists are mere stenographers for their corporate masters who, in turn, control the puppet strings for the marionettes in Washington, Brussels, London, Paris, Rome and Berlin. Wayne Madsen, a Washington, D.C., investigative journalist, author and syndicated columnist who specializes in intelligence matters, is a member of the Dignity Delegation to Libya led by former Congresswoman Cynthia McKinney. Email him at wmreditor@waynemadsenreport.com and visit his website at http://www.waynemadsenreport.com/. This story first appeared on Mathaba.net. New York City on Saturday, June 25, 2 p.m., location to be announced. Dignity Delegation member Dedon Kamathi, a producer for KPFK-FM in Los Angeles, is interviewed by Askia Muhammad on WPFW-FM on June 10, 2011, upon his return from Libya. See also the interview by PressTV of Dignity Delegation member Don DeBar this past Thursday about the war on Libya, including the attempt by the U.S. to present it as a NATO, and not American, enterprise, as well as how the cost of the U.S. wars are impacting the U.S. economic crisis. I really WANT to believe that this is not a Qaddafi propaganda campaign and these deaths really were the result of a NATO air strike gone bad (Why would they intentionally bomb a university? Come again? ), but with only TWO news outlets–Press TV and the Center for Research on Globalization–reporting on this in the last 3 days, it FEELS like a propaganda stunt. Prove me wrong. Surely somewhere someone must know whether this was a NATO missile or a Qaddafi one? Gruesome photos are one thing, but dictators have been known to spread lies and death when the doors threaten to close on their time. The west needs to see this reported on an independent, unaffiliated news outlet; not so-called "firsthand accounts" but verifiable information from verifiable sources. If indeed this was a NATO air strike, then there'll be hell to pay. the day they started their libyan so called no-fly-zone to protect so called civilians they killed more then 50 people in pakistan by drone attack. it is standard for their military actions. no dead civilians just collateral damage or fighting the enemy militants. they will never pay for that cos they are too mighty. only ordinary people will pay for those crimes again and again. it is the same as in the past and we call it "humanity". Bernard Henri Levy has been, in many ways, the instigator of this war. His words, his interviews, his intervention in the court of Sarkozy have all been instrumental in starting and continuing this crusade. Before calling him a philosopher, giving credence or non credence to his views, we should at look at who he is, his past actions and his background. How can anything just or moral result from the words and actions of such a man? Pentagon + Al-Kaida is a twins .Fashists.Nurenberg waiting them.Busturds. Good article. Regardless of the ultimate reality, it would seem prudent to have the types of matrices presented here as tools for discussions…just in case. Abroad Education Consultancy in India Scholarship guidance and admission guidance, finance assistance (Loan) and study Abroad consultants in Hyderabad we provide Part time Job Assistance and accommodation for students who are going to Study Abroadfor more details please contact newedge overseas education consultancy. http://newedgecs.blogspot.com/2018/05/ielts-exam….